October Staff Picks: Spooky, Creepy, Trick-or-Treat-y! It's Women in Translation Month! These stories are not for the faint of heart--they are dark, sometimes violent, sometimes grotesque, and deeply unnerving. This is Mariana Enriquez's first work to be translated into English and it will leave you wanting more. Reminiscent of Shirley Jackson, HP Lovecraft, and Silvina Ocampo. Mariana Enriquez is a writer and editor based in Buenos Aires, where she contributes to a number of newspapers and literary journals, both fiction and nonfiction. 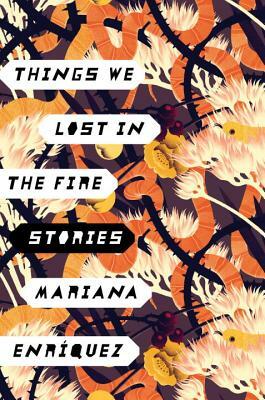 "Mariana Enriquez’s eerie short story collection, Things We Lost in the Fire, looks at contemporary life in Argentina through a strange, surreal, and often disturbing lens. In 12 stories containing black magic, a child serial killer, women setting themselves on fire to protest domestic violence, ghosts, demons, and all kinds of monsters, Enriquez unforgettably brings horror and the macabre to life. "—Buzzfeed, "31 Incredible New Books You Need To Read This Spring"
"Violent and cool, told in voices so lucid they feel spoken, these 12 tales present a gothic portrait of a country tilting uneasily away from the memory of horrific traumas, as new ones lurk around every corner.”—The Boston Globe, "The Best Fiction Books of 2017"